UK broadcast regulator Ofcom has approved new wireless technology that will give access to TV white spaces – unused parts of the TV frequency band. Ofcom said new wireless applications for businesses and consumers will run on the white spaces, with the new technology due to be deployed by the end of 2015. The wireless technology will access the radio spectrum in the 470 to 790 MHz frequency band, sharing this with Digital Terrestrial Television (DTT), including local TV. “White space spectrum in the TV frequency band is appealing for industry because it can travel longer distances and more easily through walls than the bands mainly used by other wireless technologies, such as Bluetooth and WiFi,” said Ofcom. 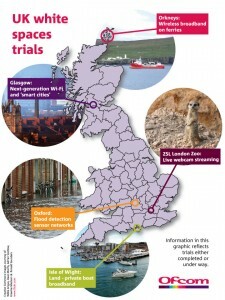 The regulator said that industry is already testing a range of uses for this technology, including: internet access for ships and boats in the Orkney Islands; new ‘machine-to-machine’ networks for flood defence in Oxfordshire; and live-streaming footage of meerkats, Asian otters and giant Galapagos tortoises on YouTube – something that Google and ZSL London Zoo has been trialling. “Ofcom is laying the foundations for industry to use database controlled spectrum sharing to deliver innovative new services to benefit consumers and businesses,” said Ofcom spectrum group director, Philip Marnick.